Genesis Gaming has recently announced a new game that has a zombie theme, this game is now released and can be played right here for free. This game is none other than Attack of the Zombies. The game, as apparent from its title, has a zombie theme that takes players on a fun and an action ride. Players will get to join 4 zombie hunters who are trying to survive the zombie apocalypse. Players will not just join them for the fun of the adventure, as they will get to claim plenty of rewards and bonuses along the way. Try out the game here for free with demo credits and see what the game has to offer. Attack of the Zombies is a 5 reeled game that has the basic setup of 3 rows of symbols. Across these reels and rows, players will find a total of fifty wager lines. Players will place their bets on these lines underneath the reels. It is where the control panel of the game is located. Players will go through different betting options in order to determine the final wager. The control panel also has the spin button, the auto play function, the sound option and the paytable. The game offers players an action packed ride that is like none other. This is because the game takes players on a wild adventure with four female zombie hunters during the zombie apocalypse. They will venture across the lands, hunting down zombie monsters and bosses. This is why the reels of the game are located in a cemetery where the dead rise to haunt the living. As for the symbols, they include the 4 female zombie hunters, their zombie counterparts, zombies, zombie bosses, the bonus zombie icon, the antidote potion and more. Even the sound effects of the game would help immerse players into the theme for a more enjoyable gaming experience. Attack of the Zombies, being a game by Genesis Gaming, comes packing a great set of bonuses and features. The first of the special icons is the wild substitution icon. This icon comes in the form of the wild brain. The wild brain will replace all icons, except the bonus symbol. The wild will substitute for the icon that is going to result in the highest payout possible. There is also the bonus zombie icon. The bonus icon can pay in any positions, this is because these payouts are multiplied by the total wager placed. Also, a minimum of three of these icons would trigger the antidote free spins. 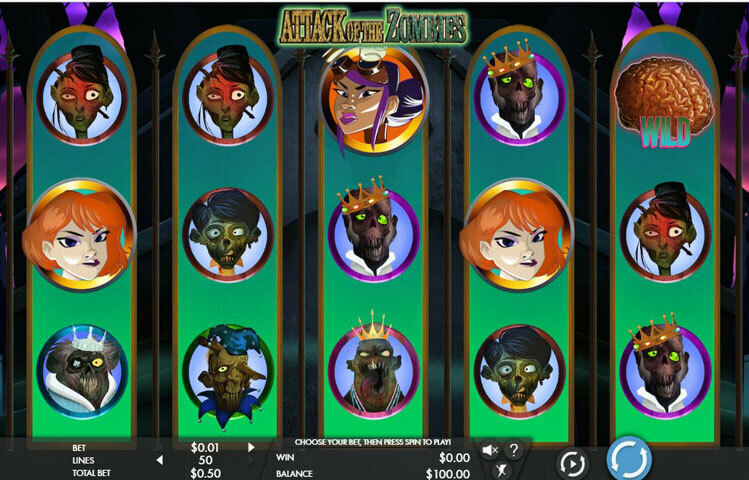 In this feature, the 4 zombie hunter icons would turn into zombies and players will start claiming rewards, free spins and more as they search for the antidote, in order to cure the zombie hunters from the zombie virus.